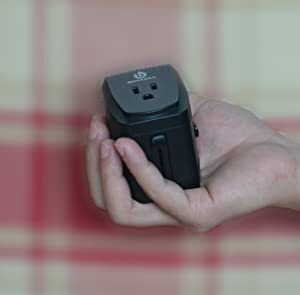 The Smallest & Lightest Universal Travel Adapter and Converter You Will Ever Need. BONAZZA TC2017 travel adapter converter combo is the smallest and lightest to date for use with U.S. and Canada appliances abroad like hair dryers, laptop, iPhone, MacBook etc. This voltage converter converts foreign electricity from 220-240V to 110-120V. Do not convert the voltage. For fit into an outlet in a foreign country to charge the cell phone only. Clunky and big didn't fit properly. Always loose connection with spark of electricity, easy to fall off from the wall. The levers when used to extend the prongs is flimsy. Need to yank on the extended prongs to get it to stay in place. Very easy to blow the fuse. Bright indicator lights affect sleep. Not used of fireproof materials. Poor quality non-customized products. Compactness, smaller size, more powerful compatibility & security. Step down the voltage from 220v to 110v for your US appliance. Maximum support up to 2000 watts. Plug Lock System. Use of high-quality PC fireproof material, resistant to high temperatures up to 300°. Comfortable faint blue lights, doesn't affect sleep. 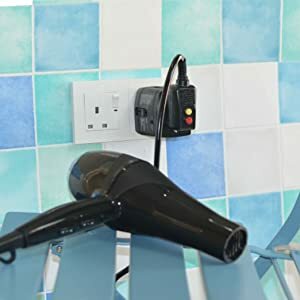 Use this converter only with Non-Electronic control heating devices that have a power rating from 26-2000 watts, such as hair dryers. For converter mode: The Converter can not be used with low-wattage appliances (0-25W). For adapter mode: Only use ADAPTER mode for DUAL VOLTAGE (110-220V, 120-240V) devices, such as iPhone charger, iPad charger, Laptop, MAC, Dual Voltage Hair straightener and other Dual Voltage Appliances. Dual voltage appliances must be used adapter mode. Before using the converter/adapter, check the product you intend to use has the proper voltage and wattage rating to run your devices. This product the power sockets only accept pin of type A and B. This product is a step-down converter, can not use converter mode in 110V countries and regions. 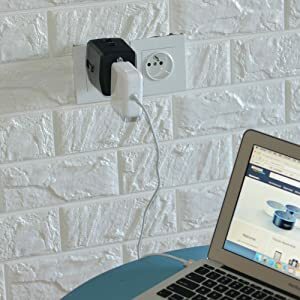 all in one travel adapter (UK/US/AU/EU Plug) that fits electrical outlets in most commonly visited countries, over 150 countries. Type G - UK, Hong Kong, Ireland. Other Countries include: Bahrain / Belize / Botswana / Brunei / Cyprus / Dominica / England / Ghana / Gibraltar / Grenada / Hong Kong / Iraq / Ireland / Kenya / Macau / Malta / Malaysia / Nigeria / Nothern Ireland / Oman / Qatar / Saint Lucia / Saint Vincent / Saudi Arabia / Scotland / Singapore / Sri Lanka / Tanzania / Uganda / the United Arab Emirates / Wales / Yemen / Zimbabwe, etc. Type I - Australia, China. Other Countries include: Argentina / Australia / China (mainland, excluding Taiwan) / Fiji / New Zealand / Papua New Guinea / Tokelau (the Union Islands) / American Samoa / Argentina / Cook Islands / Kiribati / Nauru / SaintVincent and the Grenadines / Samoa / Solomon Islands / Tajikistan / Timor-Leste / Tonga/ Tuvalu/ Uzbekistan/ Vanuatu / Uruguay, etc. Type C - German, France, Most Europe, This socket also works with plug E, F and N.
Other Countries include: Albania / Austria / Belgium / Bosnia-Herzegovina/ Bulgaria / Croatia / Cyprus / the Czech Republic / Denmark / Estonia / France / Finland / / Greece / Hungary / Iceland / India / Latvia / Lithuania / Luxembourg / Macedonia / Montenegro / the Netherlands / Norway / Poland / Portugal / Romania / Serbia / Spain / Slovakia / Slovenia / Sweden / Turkey / Ukraine, etc.